(0 Customer Reviews) | Write Review 11 issues per year Philip Pascall, owner of First Quantum Minerals, Zambia’s biggest copper producing company, once said that whenever he is asked anywhere in the world what Zambia is like, he pushes over a copy of The Bulletin & Record and says “Read that”. His approach, and that of thousands of others, is why the magazine is Zambia’s best read by a country mile. Each month it covers current affairs, business and finance, economics, comment and opinion, culture and history, art and books, entertainment, fashion, health, motoring, food and sport. It is one of the very few publications in Zambia that is not owned by or beholden in some way, to partisan political interests. It is, in a word, independent, financially and editorially. It is published by its parent company, Original Publishers Ltd., a not-for-profit company. The magazine is investigative, reflective, analytical, and insistent on quality of thought, writing and production. Its staff writers are among the very best journalists in the country, a fact attested to by the number of awards they win. The last issue of 2015 & the first issue of 2016 - don't miss it! Philip Pascall, owner of First Quantum Minerals, Zambia’s biggest copper producing company, once said that whenever he is asked anywhere in the world what Zambia is like, he pushes over a copy of The Bulletin & Record and says “Read that”. 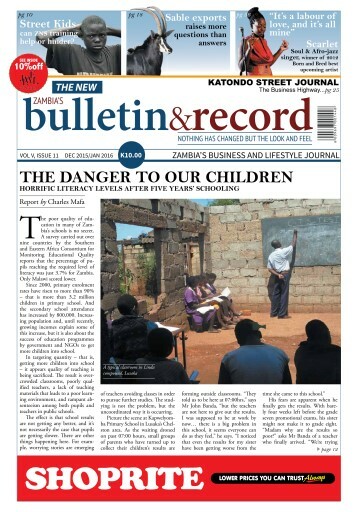 The Bulletin & Record is still developing and growing. It now hosts a supplementary insert called The Junior Reporter, which is produced by secondary school pupils and we see through their eyes the society they and we inhabit and how they think it can be improved. Further ambitious projects are in the pipeline. You'll receive 11 issues during a 1 year The Bulletin & Record magazine subscription. You'll receive 11 issues during a 1 year The Bulletin & Record magazine print subscription.